5A Molecular Sieve is an alkali alumino silicate; 5A molecular sieve is the calcium form of the Type A crystal structure.5A Molecular Sieve has an effective pore opening of 5 angstroms (0.5 nm). 5A Molecular Sieve is an alkali alumino silicate;5A Molecular sieve is the calcium form of the Type A crystal structure. 5A Molecular Sieve has an effective pore opening of 5 angstroms (0.5 nm). 5A Molecular sieve will adsorb molecules with a kinetic diameter of less than 5 Angstrom and exclude those larger. 5A Molecular Sieve is especially suitable for PSA adsorber applications where it may be used for the separation of normal- and iso- paraffins (C4 to C6 species), in PSA hydrogen purification and in oxygen concentrators. The strong ionic forces of the divalent calcium ion makes it an excellent adsorbent to remove water, CO2, H2S from sour natural gas streams, while minimising COS formation. Light mercaptans are also adsorbed. It is also used for the separation of normal- and iso paraffins. 5A Molecular sieve can be regenerated by either heating in the case of thermal swing processes; or by lowering the pressure in the case of pressure swing processes. 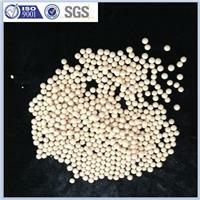 To remove moisture from a 5A molecular sieve, a temperature of 250-300°C is required. A properly regenerated molecular sieve can give moisture dew points below -100°C, or mercaptan or CO2 levels below 2 ppmv. 5A Molecular Sieve are available in beads of 1-2 mm, (10x18 mesh) 2-3 mm, (8x12 mesh) , 2.5-5 mm, (4x8 mesh) and as powder, and in pellet 1.6”, 3.2”.